Marianne Vos has taken her third and second consecutive world championship women’s road race title in a spectacular race in Florence. The Dutchwoman confirmed herself as a true cycling great as she made a solo break from a select group of elite riders on the steep climb of the Salviati, around 5km from the finish. Olympic road race champion and cyclo-cross world champion Vos then impressively held off chasers Emma Johansson of Sweden and Rossella Ratto of Italy, who took second and third respectively. Earlier in the day, the first 57km or so leading up to the circuits around Florence passed fairly uneventfully, save for a number of unsuccessful attempts at forming a break. It wasn’t until the peloton hit the first of five difficult, hilly circuits through Florence that the race began to open up, as the US team set a hard pace on the front of the main bunch as they headed up the first ascent of the main climb of the race, the Fiesole. The pace caused significant fractures in the peloton, with a large number of riders falling off the leaders within two laps. 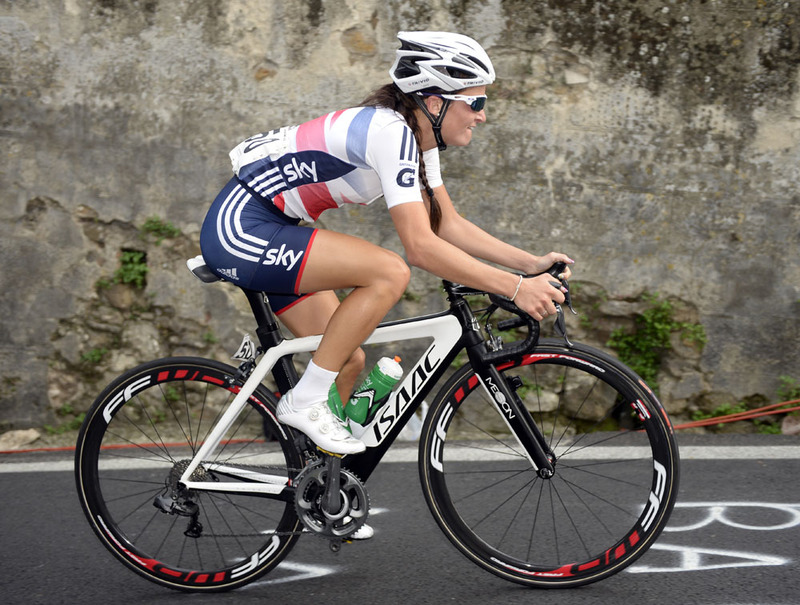 Team GB particularly suffered, as all but Lizzie Armitstead failed to stay with the pacemakers going into the third lap. The US team’s early efforts failed to pay off though, as they lost almost all their riders at the halfway point of the circuits, while Armitstead also paid the price of having no support by falling back within the fourth lap. 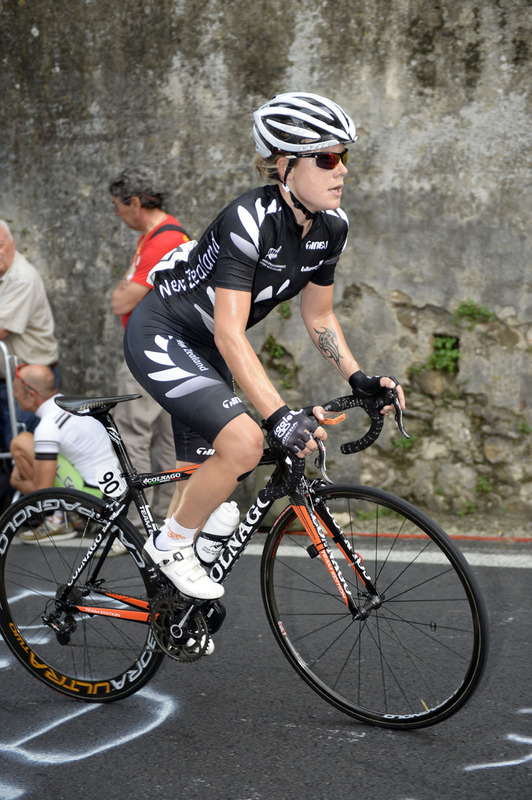 Gradually, the lead group became smaller and smaller until a select group of eight riders including three Italians: Ratto, Tatiana Guderzo and Elisa Longo Borghini; two Dutchwomen including Vos and Anna van der Breggen, as well world number one Johansson, Evelyn Stevenson of the US and Tiffany Cromwell of Australia. It looked as though they would be the eight to take the race to the finish, but the later descents of the fourth lap allowed Linda Villumsen of New Zealand, Claudia Hausler of Germany and Russia’s Tatiana Antoshina to claw back on going into the final 16.6km lap of the 2013 race. Elena Kuchinskaya of Russia and Ferrand Prevot of France also managed to briefly catch the lead group after a long chase on to make it 13 riders at the front. The 13 rider group didn’t last long though, as the Fiesole loomed once again the lead group began to decimate. An injection of speed from Evelyn Stevens on the fierce 4.5km climb immediately dropped Kuchinskaya and Prevot, closely followed by Hausler and Antoshina. And by the time the leaders had reached the top of the climb, the Italian’s three rider unit had fallen to one as Ratto had to manage alone, while Villumsen also fell 15 seconds back with just 10 km to go. It was then down to five towards the finish, with the Dutch already looking ominous as they retained two riders in the group. Finally, on the 16% gradient of the Salviati, Vos launched her attack, with no-one able to stay with her. Ratto and Johansson regrouped to attempt to bring her back, but began looking at each other in competition for silver, just as they entered the final kilometre of the race. Van der Breggen rolled in fourth after impressively supporting her team leader, and it was said leader Vos who once again claimed gold and the rainbow jersey, demonstrating why she really is the best in the business.